Lately, I’ve been making some matching pieces. In the world of adoption, bonding and attachment are critical. Obviously, that’s true for non-adoptive families as well. But, in families where children and parents don’t always share physical characteristics, the same race, birth country and history it is nice, when parents and children share something. My own five-year old is happy we both have glasses, still likes to match same-colored shirts and I’ve made us matching mother-daughter necklaces. If I’m going away for a while, even for a night meeting and not home before bed, I can kiss her necklace and she’ll wear it and “carry” my love and she will “kiss” mine so I can carry hers. Also, sea glass is special, because as with people two pieces can never be exactly the same. The history of each is unique and though pieces can be made to match in color and size and shape, they are still unique. 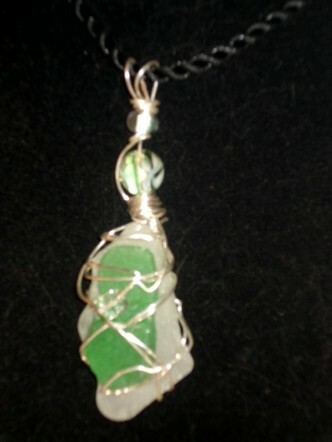 Beads and wire and necklaces can make pieces “go together” better but each and every piece of sea glass has a story all her own. And I do think of these children of the sea as lost, tossed, scattered, broken in a fight or an accident. Later, the sea, like love, changes their shape and texture, but can never steal their history and their past even if is unknown. So, the “matching” pieces have meaning to me. They help celebrate and connect mothers and daughters. Here are some “sets” and I have to say I wish I was a better photographer. The hue of pink isn’t captured. The light aqua color almost translucent isn’t revealed by my photo taking limits. The purples barely blare their color. But, here’s an idea of what the matching pieces can look like. These are small matching purples. These aquas are lovely. The color matches though the wire styles are different. I am trying to learn how and where to display pieces. This is a newer white with green on top. I am a fan of the colors many consider common (white, green and brown) as much as I am of the much harder to find, reds, pinks, purples and virtually any shade of blue. I heard this today, in song, at a Unitarian service for families. It was such a fantastic service. I don’t know who this is by (please leave me a comment if you do). I want to share it as it’s touching to anyone. It spoke to me. At other points in me life it would have stung and healed the survivor girl but today it was the mother in me who heard the words. I looked at my little girl born in China who recently ask me if all people who give birth have their babies go to others to be adopted. She is just starting to grasp that some, indeed most, who deliver children do go on to raise them. The mind, always approaches complicated subjects, from many angles. -Catch of the day: Another one of gratitude for the card, with the hand-written note, the invitation to this service. To the person who sent it and went out of her way, though sick, to make sure I met many people and felt comfortable and who has a fabulous and kind family. It was a wonderful way to start my Sunday. My girl was so at ease and running and crawling and playing after arriving feeling reserved. I am finally learning to honor her personality. O.k., this is the third and final section of my notes about this ASAP conference. It was a panel discussion led by Hollee McGinnis who works for the Evan B. Donaldson Institute and who founded Also-Known-As, Inc. (see websites at the end of the email). It was interesting that for most respondents, the adoption identity grew in importance throughout the life cycle and racial identity was most significant in college and young adult years. It will be wonderful to read the entire report to get the actual stats and also the way the stats are analyzed, the way the questions are worded and what respondents said. For those who experienced adoption discrimination, it was done most often by extended family. Adoption discrimination, she said, “Assumption that everyone has ready access to genetic/biologic information.” She talked about school assignment and well-meaning questions, the question being asked regularly, “Why were you adopted?” and she said, “No ones asks why were you born” and if we inserted the word born into questions people ask about adoption we’d realize how personal, private and intrusive many questions are. Adoption, she said, can be like a cake with many layers. The number of layers vary depending on people’s history and experiences. One layer might be family of origin, another layer, adoption, another layer foster care, another layer race/ethnic identity, another layer is transracial adoption. She said, for her, she came to a point where she came to be with all of her story. She said, “the question of who I am can only be answered by who am I? When people commented about the importance of culture camps she said, “It wasn’t the fan dancing or Tae Kwon Do that was great but the one week reprieve from having to explain myself” that people appreciated. She said, adult mentors of same race important. Not forcing culture but opening the door. I wish I had heard an entire keynote address as she was a great speaker, summarizing facts and research and mixing it up with more personal stories or quotes as well. LOOK FOR THE REPORT FROM THE EVAN B. DONALDSON INSTITUTE COMING OUT IN 2008 (jan. i think) on ADOPTION AND IDENTITY!!!! Adoption is a complicated subject and what we often have is case-history from or about one of us personally or professionally. But, it’s much too broad a subject to do that. My note: I’ve heard this from Beth O’Malley as well who respects personal AND professional experiences but values nothing more than a combination of both. Adoption, like marriage, incorporates families. You get the birth family because they come with the child. They are a part of your family. You incorporate them in your mind and heart if not your life. Like, in-laws, you don’t have to like it or like them but they are a part of the package. She said “root families” where the same people conceive, deliver and raise their children are probably more uncommon. Adoption isn’t an incident or an event. In Hawaii, adoptions are open and there’s a phrase, “hanai” which has been done for centuries. She said, for many cultures, process of birth goes to age two and at that age their is a ceremony where primary family (adoptive family) is acknowledged and where birth family is treated forever as aunt/uncle and a part of the family. She said she heard a man speak of being “hanai’d” and being the “holder of 2 families” and wished we had that openness in U.S.
She said things are getting better in the U.S. but impression is still that it’s really “too bad” and it isn’t at a point where adopted people are respected (or adoptive parents or birth parents – especially birth mothers). She spoke of the big difference between secrecy and privacy. She said a secret is when info. about you is kept from you whereas privacy is not sharing info. at the supermarket. She talked about how in adoption there’s a need to talk to children about these heavy big issues, “before they’re developmentally ready” but it’s necessary. She says you have to tell your child early on and help them deal with feeling of loss – loss of birth family for them, loss of biological child for adoptive parents, loss of child for birth family. She says the loss has to be balanced with joy. For an adopted person there’s the loss of genetic and cultural history, birth family’s religion, siblings sometimes, being part of a traditional family and self-esteem. For birth family there is the loss in not raising child, not 100% sure they did the right thing or the loss of approval from others. At pre-school age, anger can cover fear/sadness. She said, sadness sits still whereas anger moves and can be re-directed. She said, kids who are adopted are thinking about “complex matters” and school touches on these issues. Of course kids are distracted she says, the readings and assignment can cause emotional difficulties. But she’s clear that children are reacting/acting “normal under the circumstances” and shouldn’t be pathologized. But, we have to be sensitive to what gets brought up and stirred up with certain conversations and discussions and assignments. The subjects kids are learning can interfere with learning even in absence of any learning issues. She talked about how often parents go to school to help educate teachers and students about adoption. She talked about how this can embarrass kids and cause privacy issues or awkwardness. She suggested parents team up and go to various schools to do training so it gets done but isn’t as personal as having it be done by the parent. She emphasized saying/thinking, “normal under the circumstances” as opposed to pathologizing kids and issues. She said sometimes therapy pathologizes but she did think consultations were important, especially for parents. So, a week ago today I spent my Saturday at an Adoption and Education Forum. It was sponsored by the Adoption & Foster Care School Awareness Project and had some big name speakers such as Joyce Maguire Pavao and Hollee McGinnis. Boris Gindis was there as well and I have some notes from his talk too. I had not heard of him before but he was interesting. Anyhow, these are just my notes. Points were made that were interesting, educational and thought-provoking. I’m still sorting out what I believe, feel and need to learn about. Feel free to do the same. language mediates experience. ex. a child can learn boiling kettle is hot by touching and burning hand (that’s a direct and unmediated experience) or she can learn by a parent saying, “Don’t touch. This is hot.” That indirect and mediated. Children in orphanages have had more unmediated learning and when exposed to education are not always ready to benefit by mediated learning. He says education must be rebuilt and re-mediated first. He noted that more school-age children, or “older” children (children older than age five) are being adopted. In 1995, 3% of all adoptions were of “older children” and now it’s 21% of adoptions. The swiftness at which children lose language when adopted is astounding. Even those who can read and write in native language still have a high and rapid language attrition process. 99% of adoptive families do not speak the language of their child’s birth country. A child of three will lose most expressive language in the first three mos. Receptive language may last a bit longer but is generally lost within a year. He says, in an article he distributed, “Language Development in Internationally Adopted Children,” originally published in China Connection (A newsletter for New England Families who have adopted children from China – which I write for as well), the following (about children born in China). “They are monolingual upon arrival (Chinese only) and after several months are monolingual again, only this time in English. He stresses that thinking that these children are bilingual is an “erroneous” approach, especially from an educational approach. Why is language loss so rapid? 4. Negative attitudes of life before adoption. When adopted, everything is new and language is a link to old life which, if from an orphanage can be a reminder of suffering (even unconsciously in children). In a sense the language of birth country can remind a child who has been in an orphanage of time when they were hungry, cold, etc. He said, “Mere sound of language can be a PTSD trigger.” In fact, he said, having a daycare or nanny who speaks native language when parent does not will impede bonding and attachment with parent (that was a surprise to me). For “older children” losing language, behavior regresses. A six-year old who could read and write in native tongue can lose language and behave like a two-year old. In fact, he said, children with most advanced and developed native tongue can have most difficulty behavior wise. Again, if you realize that language mediates experience, the loss of it means the loss of associated skills which impact behavior. With children adopted at “older ages” the actual readiness for school and the actual “school” age can be very different. It is a mistake to treat IA (internationally adopted) children in same category as ESL learners. ESL learners have mediated learning in home environment usually while IA learners do not. Remediation is recommended in home, school and in community. The education of teachers is “paramount” he said because so far, most training is “sensitivity based” and provided by adoptive parents. However, he said, “a full assessment of differences in educational means to assess needs” is needed. He suggested parents put a statement in IEP (individual education plans) saying something such as, “Professionals must learn specificity of children and adapt to children” and list articles, courses, workshops, etc. Stay tuned for notes from the other speakers (next blogs) and my thoughts. I welcome your comments! The cool coincidence is that my aunt didn’t know I went to this conference and that she was the key speaker on the panel.